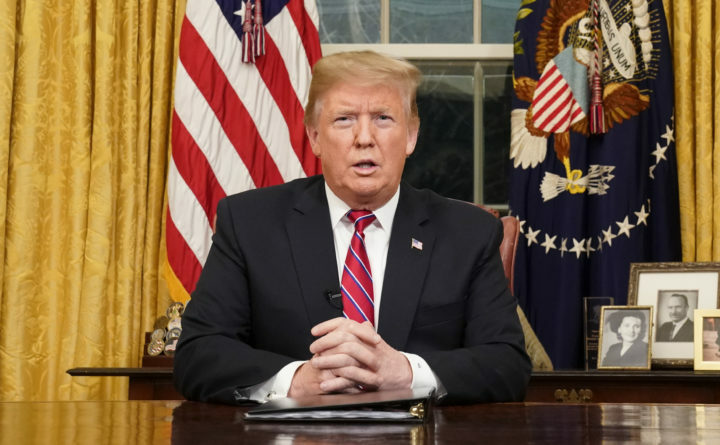 President Donald Trump delivered a forceful and fact-challenged televised plea to the nation Tuesday night for his long-promised border wall, declaring “a growing humanitarian and security crisis” at the southern border and blaming congressional Democrats for the partial government shutdown that he helped instigate three weeks ago. “Nothing President Trump said tonight demonstrates that this wall is anything more than a monument to himself. It only serves to divide us and distract us from the important discussions we need to have about immigration reform, the treatment of those seeking asylum in our great country, and the best way to allocate resources to secure our nation from within and without,” Pingree said. U.S. Sen. Angus King, an independent who caucuses with Democrats, called Trump’s demand for a physical wall on the border a “false choice” between a wall or open borders. Trump made a number of other claims that are demonstrably false. He said the border wall will “be paid for indirectly by the great new trade deal we have made with Mexico.” But that deal, a reworking of the North American Free Trade Agreement, has yet to be ratified by Congress – and even if it were, it would not “save” the United States any money because smaller trade deficits do not necessarily translate into greater revenue for the federal government. There is also no provision earmarking money for a wall. The political environment has driven Trump to pull out all the stops. The president intends to take a rare trip to Capitol Hill on Wednesday, joining Vice President Mike Pence at the Senate Republicans’ weekly policy luncheon. Trump has been consulting in recent days with outside friends and advisers, including such conservative allies as Rep. Mark Meadows, R-North Carolina, and Fox News Channel host Sean Hannity. Washington Post writer Josh Dawsey, Mike DeBonis, John Wagner, Seung Min Kim, Erica Werner, Glenn Kessler, Meg Kelly and Salvador Rizzo contributed to this report.